It's easy to see what's been hurting the global tobacco giant by looking at these simple graphs. Tobacco giant Philip Morris International (NYSE:PM) has an expansive business that spans the entire globe. The company has more than 50 production facilities in 33 different countries, producing more than 870 billion cigarettes each year to serve customers in more than 180 nations around the world. Yet even though the global market gives Philip Morris a huge opportunity to maximize revenue and profit potential, it also brings the challenge of handling currency fluctuations. In recent years, the strength of the U.S. dollar has hurt Philip Morris badly, and it's uncertain how quickly the tobacco giant can bounce back from adverse trends that appear poised to continue. Below, three charts will show just how big of a problem currency has been for Philip Morris, and why investors are concerned with its future. Throughout much of its tenure as a separate publicly traded entity, Philip Morris International went through fluctuations in the foreign currency markets that cancelled each other out. During the U.S. financial crisis in 2008, for instance, the dollar's value fell against many major foreign currencies, boosting its prospects. In the ensuing recovery, the dollar gained back its lost ground. For several years, currency markets rose and fell, staying within a fairly tight range. The net impact on Philip Morris was minimal, helping to boost growth during weak-dollar years and creating minor headwinds when the dollar rebounded. The Dollar Index includes contributions from six major foreign currencies. The euro has the largest weight in the index, as it used to include several different national currencies that were integrated into the euro at its formation. However, the Japanese yen, British pound, and Canadian dollar also have substantial weightings, and the Swedish krona and Swiss franc play minor roles in the movements of the index, too. 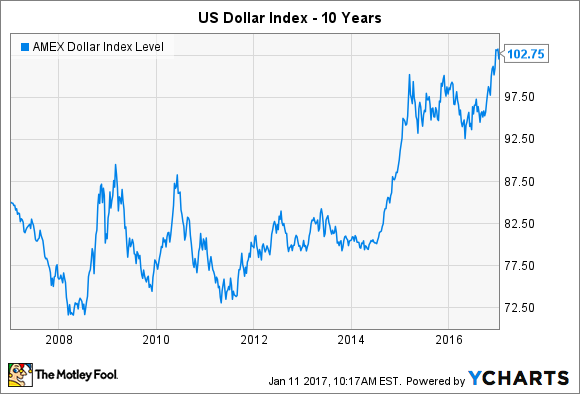 After years of relative stability, the Dollar Index soared in 2014 and 2015 to levels not seen in more than a decade. The reason had to do with the health of the U.S. economy compared to its peers around the world. Throughout much of the globe, major national economies were stagnant or contracting, and that led central banks to cut interest rates and provide other forms of stimulus in order to spur greater economic activity. Meanwhile, in the U.S., easy monetary policy had already run its course, and investors started to anticipate the inevitable uptick in interest rates that would eventually follow. 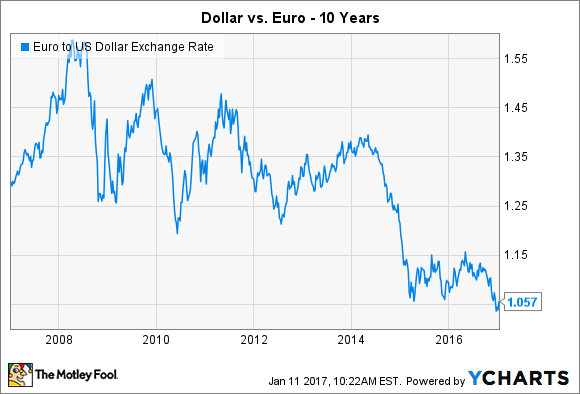 At its height, the euro reached the $1.60 level during the financial crisis, and even after the dollar recovered, a range of $1.20 to $1.50 per euro held steady for years. Yet the plunge in the euro from late 2014 to early 2015 took the European currency toward parity for the first time since the early 2000s, shortly after its initial adoption. The euro is especially important for Philip Morris because of its European presence. The European Union alone makes up almost a third of the company's net revenue, and it's more profitable than any other region of the world by a substantial margin. Moreover, Philip Morris' Eastern Europe, Middle East, and Africa segment relies heavily on the rest of the European continent, and although those countries don't have the euro, most of their currencies either track the euro fairly closely or have had their own reasons to depreciate in value against the U.S. dollar. 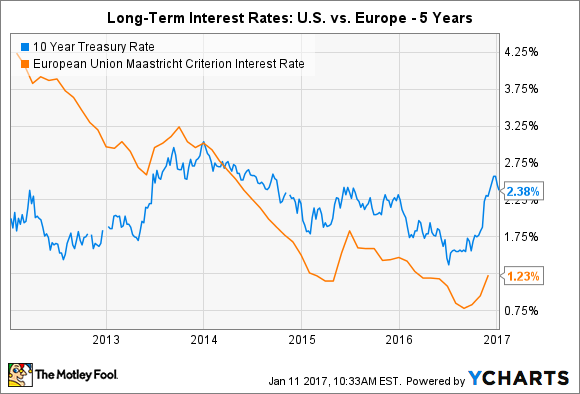 As you can see above, interest rates in the European Union have fallen more sharply than U.S. interest rates over the past five years, and the spreads between U.S. and European bonds are at extremely high levels from a historical basis. In healthier parts of the EU like Germany, bond rates have actually been negative at times. Meanwhile, in the U.S., long-term interest rates have risen sharply in recent months. The election of Donald Trump as the next president led to a shift from the bond market to the stock market among investors, and the bond-market decline sent rates up as much as a full percentage point from their lowest levels of 2016. European bonds also saw gains, but friendlier monetary policy could keep downward pressure on the euro and support further dollar strength. Philip Morris International has already seen its earnings and revenue hit hard by the strong dollar. With that trend likely to continue, investors need to prepare for what could be another tough year in 2017 for the global tobacco giant.